published by Texas Tech University Press, 2014. Albóndigas illustrate the dynamism of food pathways, the routes by which foods travel via bird flights, human wars, marriages, and so on. As it travels, food changes, refashioning itself into new cultural types. This Texas Mexican meatball, albóndiga, originally comes to us from the Spaniards who arrived in the 1500s. “Albóndiga,” an Arab word, settled into Spanish cuisine because, of course, Spain was an Arab territory from 711 until 1492 when the Arabs were expelled militarily from the Iberian Peninsula. The flavoring for this meatball is chile ancho, although chipotle is most commonly used in albóndigas throughout our region. I like the taste of the ancho because it reminds me of carne con chile. The rest of the recipe is straight from the Arabic Morocco, Spanish method: bread and eggs. Three native ingredients transform this Arab dish into Texas Mexican: Mexican oregano, chile ancho, and tomatoes. Roasting the meatballs, reduces fat and gives the albóndigas a crispy, tasty exterior that goes well with the adobo. 1. Remove the seeds from the chiles by cutting a slit lengthwise in each chile to open it and remove the stem with the attached seeds. Remove all the other seeds in the chile pod. 2. Place the chiles in a large pot and cover them with water. Bring to a boil, turn off the heat, and let the chiles steep for 15 minutes so that they will rehydrate. Drain and allow to cool. Discard the water. 3. Place the chiles, onion, garlic, oregano, and salt in a blender. Add 1 cup of clean water and blend on high until the paste is completely smooth, with no large particles. Add a little more water if needed. If there are large particles in the paste after you are done blending, strain the paste through a fine-mesh sieve. Set aside. 4. Heat the canola oil in a Dutch oven and add the chile purée, with caution because there will be splatter as the liquid meets the oil. Fry for 10 minutes. The color will deepen and the purée will thicken. Set aside. 5. In a bowl, pour the milk, add the bread, and set aside. 6. Mix together the pork and beef. hands or a large spatula or spoon. 8. Add 8 tablespoons of the ancho chile purée to the meat and mix thoroughly. 9. Form the seasoned meat into 40 1-1/2-inch balls and place them on a large cookie sheet. 10. Roast the meatballs in a 400°F oven for 12–15 minutes until browned and crispy on the outside. 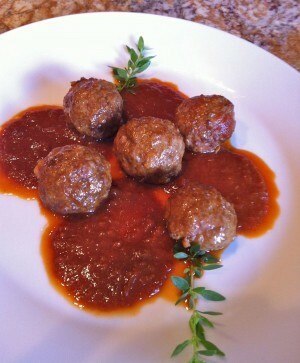 Remove from the oven and allow the meatballs to rest for 10 minutes. They are ready to serve with the adobo. 11. To the remaining chile purée add the tomatoes, chicken stock, vinegar, salt and sugar and bring to a boil. Cook for 30 minutes until the adobo begins to thicken. Taste and correct the salt. Serve the meatballs on a plate and pour the adobo over them. Or you can serve the adobo on the side, with toothpicks for each guest to dip. These albóndigas are moist and delicious even on the second day and will keep in the fridge for 5 days.